ASEAN Religious Diversity. Strength or Threat? Syllabus of the Online Course (Subject) - Religious Diversity in the ASEAN: Strength or Threat? In the ASEAN Region (Southeast Asia), cohabits democratic regimes with authoritarian or military dictatorships (Myanmar). 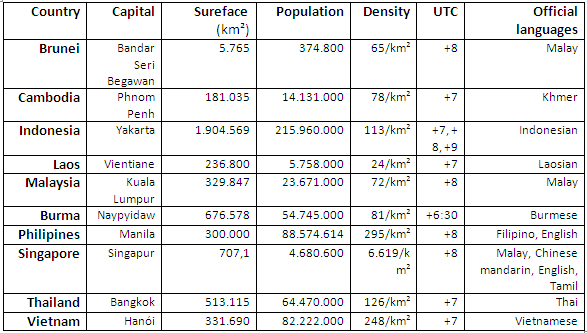 From the economic point of view, there are huge differences between the ASEAN-6 economies and the four CLMV countries (Cambodia, Laos, Burma, and Vietnam). Buddhist bloc of the ASEAN Countries consists of Thailand, Cambodia, Laos, Myanmar, Singapore, and Vietnam. The Philippines is mainly Christian. 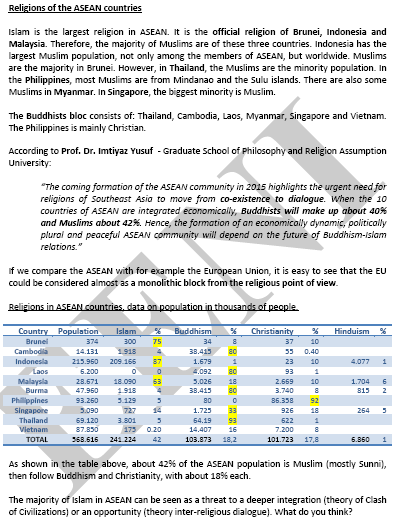 About 42% of the ASEAN population is Muslim (mostly Sunni), then follow by Buddhism (18%) and Christianity (17%). Although the official language of the ASEAN is English practically every country or even region, speaks a different language. If we compare the ASEAN with, for example, the European Union (EU); it is easy to see that the European Union could be considered almost as a monolithic block from the religious point of view.